From the Ground Up with Chris Mullins – Why do Vegetables Love Flowers? Gardening Products Review.com, “Whether you are a gardener or just enjoy reading about the gardening adventures of others, this book is for you. I highly recommend it, and I have put many of the how-to’s to work in my own garden, especially the soil blocking and seed starting.” Click to read the full review. 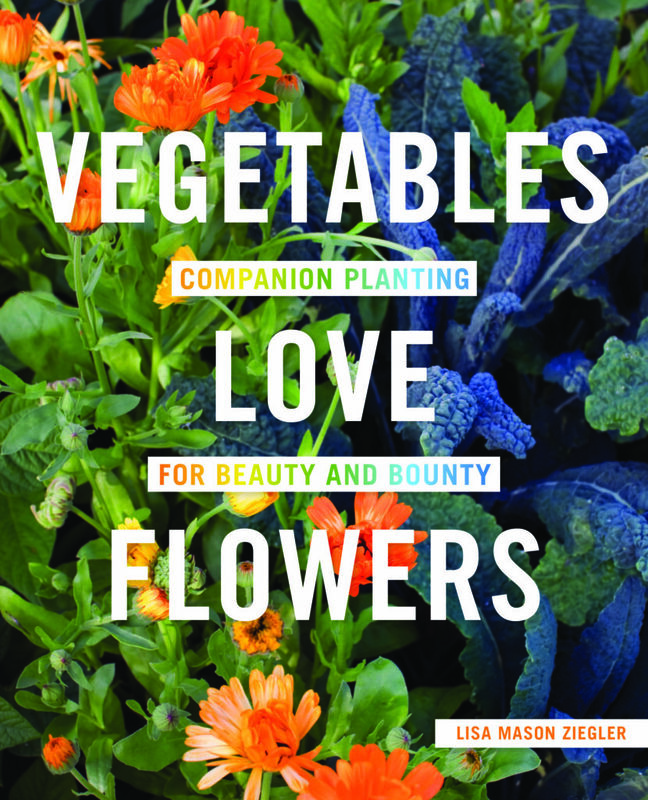 Floret, “If avid vegetable gardeners aren’t already convinced they should tuck a few flowers in with their tomatoes, peppers and beans, then this book should definitely do it.” Click to read the full review. Debra Prinzing of Slow Flowers, “Lisa wants to save the reader time and ensure success when they combine veggies with flowers.” Click to read the full review. The Master Gardener Hour with Kate Copsey. Organic Gardener Podcast with Jackie Beyer. Flowerland Hour with Rick Vuyst. Inviting Native Plant Border, courtesy of the Daily Press, March 20, 2016. Planting Young Seeds, courtesy of the Daily Press, June 28, 2015. Seed-Starting Secrets, courtesy of the Daily Press, March 2013. Lisa Ziegler on shade gardening with Hellebores, reprinted courtesy of the Daily Press Feb. 2013. 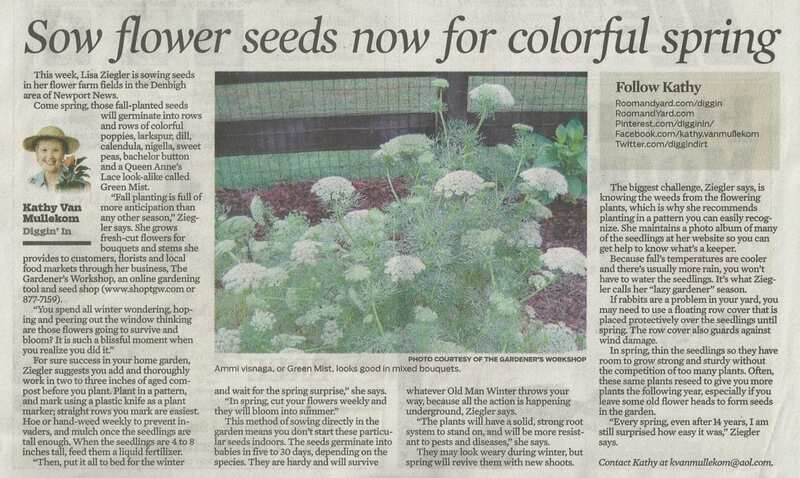 “Lisa Ziegler and Historic Garden Week”, reprinted courtesy of Daily Press, March 2013. “Reap garden rewards with fall planting”, Eagle Tribune, North Andover, Maine. Lisa shares the best kept secret in gardening, fall planting for spring blooms.“Sow flower seeds now for colorful spring”, October 2012. Lisa’s cut-flower farm is on the Newport News Historic Garden Week Tour April 2012. 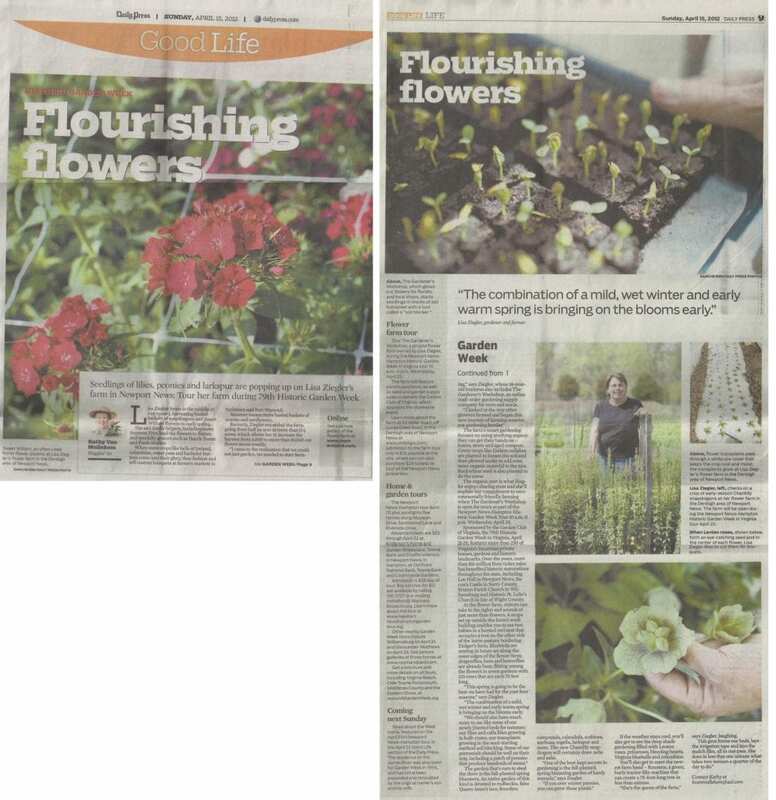 “Flourishing Flowers”, Daily Press April 2012. Lisa is living her dream, flower farming. 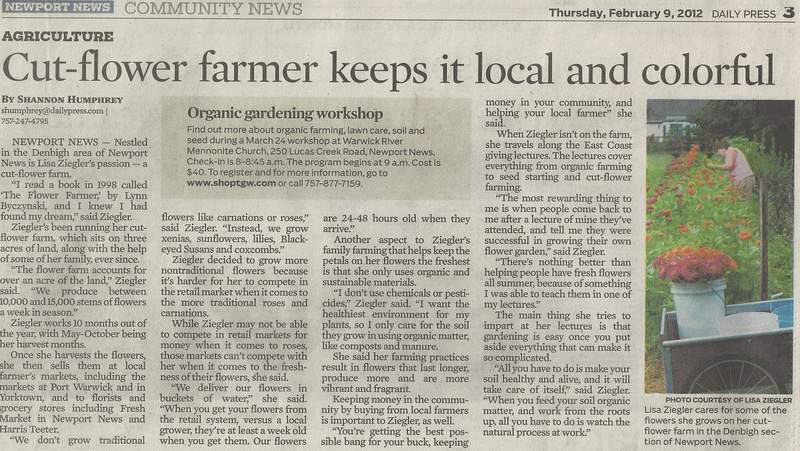 “Cut-flower farmer keeps it local and colorful”, Daily Press February 2012. Lisa’s book “The Easy Cut-Flower Garden” hits newspaper across the country. 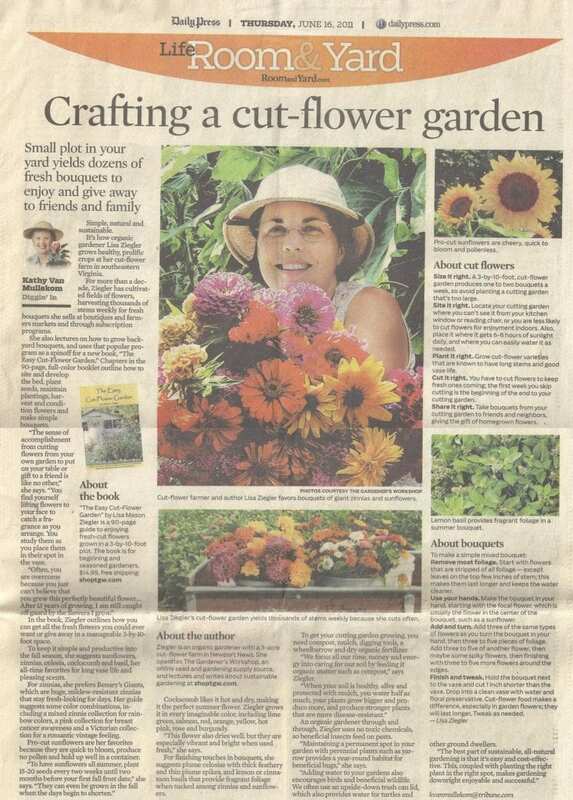 “Crafting a cut-flower garden”, Daily Press June 2011. Daily Press article “Making the Cuts”, Grow a flower shop in a small space in your backyard and take your pick to create fresh arrangements.